It is easy at times to forget we are all truly connected to one another, to our planet, to the universe as a whole, and to understand that coincidence isn't mere happenstance, but events put in place long before we are made aware of them or the part we are meant to play. It often takes a major incident to ripple the threads of light that bind us, to make us shift our focus, recognize we are being called and prompt us to action. 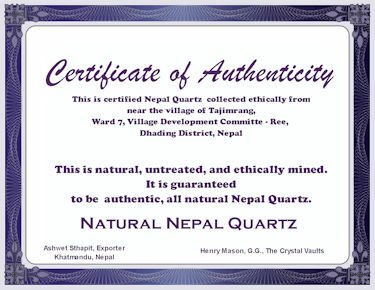 We are humbled to know that such a connection was put into place months ago where we would not only be called on to help those in crisis in Nepal, but we would have the crystals divinely placed in our trust to do just that. In the month before the first devastating Earthquake I had just completed a purchase of delicate, clear, beautiful quartz clusters from Ashwet Sthapit of Kathmandu. Our first order arrived safe and sound and as we were beginning to process it, we heard the news of the destructive earthquake that rocked his country. We were very worried. We heard nothing from Ashwet for several days. Then some good news among the bad... he and his family were okay. The fate of the village from which the quartz is mined, however, was unknown. The roads were destroyed and the fate of the village of Tajimrang was unknown. A few days later Ashwet and his partners were able to bring tents and water to Tajimrang by helicopter. What they found there was heartbreaking. The destruction is crippling the country. The international community is working to help alleviate the suffering. The Red Cross and many relief organizations are doing all they can but it is going to be a long and expensive rebuilding. While we can all help through the international relief organizations by donating to their work, there is something we can do directly as individuals – we can rebuild one village. We can make a difference to them. The village lives by mining quartz. They have a storehouse of about 2000 kg of beautiful quartz clusters from their mines. But you cannot rebuild a village and revitalize its life with a warehouse full of quartz. It needs to be sold for the cash that is needed to buy the materials needed to rebuild their village. Here is where you can help. We are not asking for donations. We are not presenting ourselves as a charity as we are not one. While we do support the Red Cross and others personally, we are crystal dealers. We can help the village rebuild buy simply helping them sell their quartz and get back on their feet and rebuild their homes. They are not asking for a handout. They are asking that we do business with them now rather than later, so they can rebuild. They just ask that we buy their quartz now. 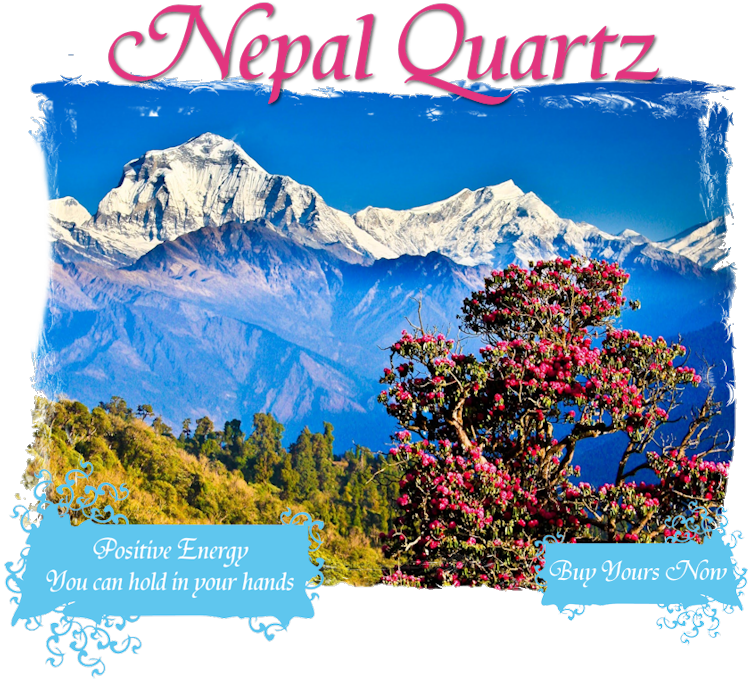 Formed in the beautiful Himalayan Mountains of Nepal, these marvelous Clear Quartz clusters are true survivors, Harbingers of Hope, divinely spared from earthly devastation in order to assist those in crisis in Nepal. Their journey is extraordinary, as they were meant to find their way to you. As beacons of light and positive energy, they can bring you hope and healing, aid in your struggles of survival, and help to explore your thread of connection to humanity. Use them in your daily thoughts, feelings, words and actions, and integrate their compassion into the world. Himalayan Quartz carries the purest spiritual energy on the planet, and crystals from Nepal are known for their amazing clarity, brightness and sparkle; most of the clusters offered here are remarkably “water clear.” They are the supreme gifts of Mother Earth, and even the smallest is imbued with the properties of a master healer teacher. Ancients believed Clear Quartz to be alive, taking a breath once every hundred years or so, and many cultures thought them to be incarnations of the Divine. Wearing, carrying or meditating with a Clear Quartz crystal opens the mind and heart to higher guidance, allowing the realm of Spirit to be transmitted and translated into the world of physical form. Resonating at the level of an individual’s needs, Clear Quartz also amplifies whatever energy or intent is programmed into it, and continues to broadcast that energy throughout the world and into the etheric realms. This may accelerate the fulfillment of one’s prayers, intensify healing or spiritual growth, or simply allow the crystal to hold a pattern of energy long enough and strongly enough for the manifestation of a goal to occur. Clear Quartz crystals work to stimulate and balance all of the chakras, and are the most versatile and multidimensional stones in the mineral kingdom for healing, meditation, expansion of consciousness, communication with angels and guides, past-life recall, attracting love or prosperity, or amplifying the energies of other stones. 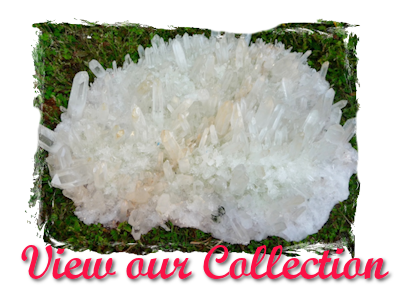 Like humans, each of these crystals is unique and we hope you find among our listings beautiful partners of hope that resonate with you and your journey in life, and will help the souls in need in Nepal. Remember these as gifts for loved ones and the survivors you know, for special occasions or simply to connect, and share the story of these extraordinary crystals. We have 40 kg of Nepal Quartz for sale immediately. We had it flown directly from Nepal. We intend to use the money from this sale to buy more, and from that sale to buy more. We want to help the village by finding homes for all their Quartz. If we can do that, they will be able to rebuild and begin their lives again. and thanking you for your purchase.